In his letter Frank tells Eleanor he can be found "out in the open in a place where I first lost you". To jog her memory she and Leggett visit places she went to with Frank, places that inspired his painting. The director chose a series of well-known tourist spots, beginning with Fisherman's Wharf. Then ... They begin by strolling down a boardwalk with a white building off to the right. ... from 1951 ... below is an aerial photo of Fisherman's Wharf taken the year after the movie was shot. They were walking along the boardwalk in the center of the harbor. The same white building is there (arrowed) and above that is the twin Piers 45, Sheds A and B. ... and Now, the white building has been replaced by the Fisherman's and Seamen's Memorial Chapel but Pier 45 Shed B can still be seen behind it. 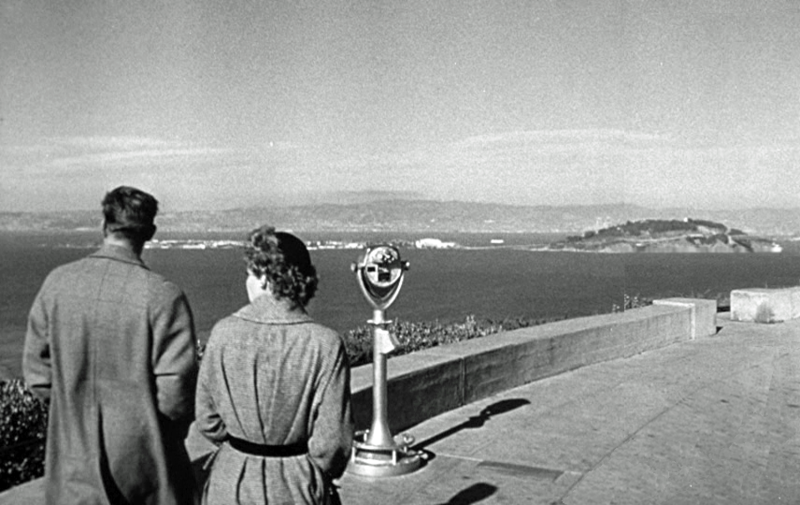 Next they go to Pioneer Park at the top of Telegraph Hill with its sweeping Bay vistas. Then ... They have an unobstructed view of Treasure Island, Yerba Buena Island and the Oakland Hills beyond. ... and Now, ah, an opportunity for CitySleuth to vent a pet peeve. The expansive views have become blocked by the overgrown trees. We see this again and again, all over town. Why do the City Elders allow this to happen? If for no other reason, visitors to our glorious city deserve to experience it in all its glory. Case in point, this tourist is fortunate to find a place where she can get a partial view, albeit not for long. Then ... Here they are at Larkin and Fulton at the garden between the War Memorial Opera House on the right and the almost identical War Memorial Veteran's Building on the left. The two buildings form bookends framing City Hall in all its majesty across Van Ness Avenue. ... and Now, this photo could have been taken 60 years ago. Are those really the same pollarded trees bordering the garden? CitySleuth would guess yes. Then ... Finally they try their luck at St. Mary's Square on California Street heading towards Chinatown's Sing Chong Building and the 1854 St. Mary's Catholic Church facing each other across Grant Street. But still no sign of the man on the run. The Sing Chong Building was one of the very first structures rebuilt after the 1906 earthquake by Chinese owners; they hired white architects but specified its oriental look. Its sister, the Sing Fat Building, is opposite it across California, just out of this view. ... and Now, A few years after the movie was filmed the square was converted into a covered garage with a new St. Mary's Square park above it. The view across California remains the same.